You’d be forgiven for thinking that the yamaha CD-NT670D was nothing more than a typical hi-fi CD player, albeit one with a rather slim profile and compact dimensions. But looks can deceive, as is the case here. Packed inside that tiny (314 x 70 x 338 mm) chassis is not only a highly specified CD player, but also a fully fledged music streamer and a DAB/FM tuner, with support for Yamaha’s MusicCast multi-room audio system. It comes as part of the MCR-N670D and MCR-N870D mini hi-fi systems, but it can also be purchased separately and connected to any hi-fi system with an analogue input. It comes in 2 versions, the CD-NT670 being the model below it in the range. The only apparent difference between the 2 models is the omission of a DAB tuner in the lower model, but the two are otherwise identical. Only the DAB-equipped CD-NT670D model is available in the UK, however. Purchase an MCR-N670, and you’ll get the A-670 amplifier and NS-BP301 speakers as part of the package. The MCR-N870 system gives you an upgrade to the A-U670 amplifier with its DSD-capable USB DAC, and the larger NS-BP401 speakers. Those models are equipped with a CD-NT670 network CD player, but if you purchase the model of either system with an appending D you’ll receive the CD-NT670D which includes the DAB tuner. The model on review here is the CD-NT670D, which we’ll simply refer too as the 670D from here on out. Naturally, the main selling point of the 670D is its compatibility with Yamaha’s MusicCast multi-room audio system. At first glance you’d possibly be forgiven for thinking that musicCast was simply another competitor to the likes of Sonos, but the MusicCast system is far more versatile, bridging the gap between traditional hi-fi and lifestyle audio products. It’s also one of the largest systems, boasting a portfolio of more than 30 products including traditional hi-fi components, small speaker systems and even a piano. 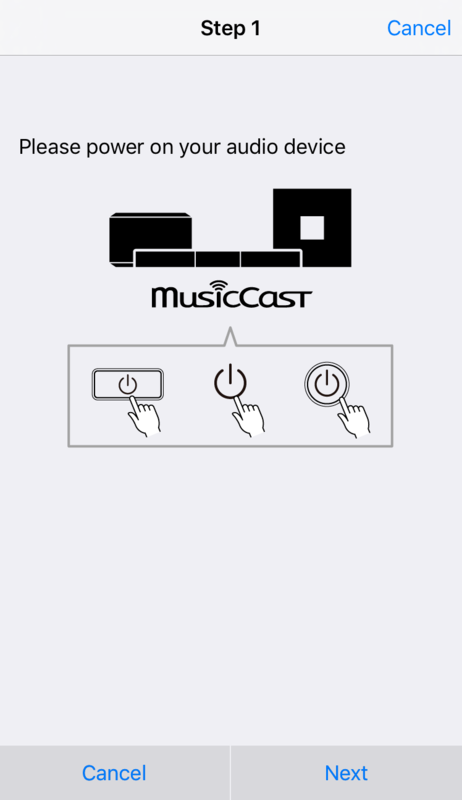 All MusicCast products are designed to be used individually or in conjunction with one another. 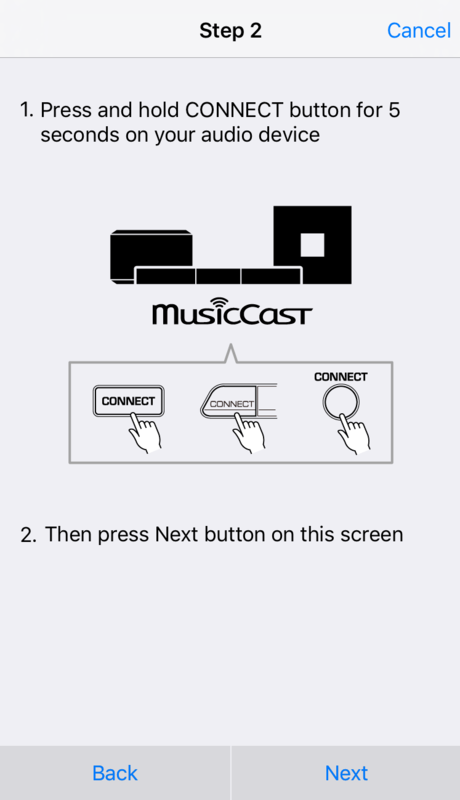 For example, if you purchase a MusicCast speaker such as the WX-030 as your first MusicCast product, you’re able to use it both as a traditional Bluetooth or AirPlay speaker, and even control it via the MusicCast app. There’s no central hub controlling the system, no complicated wiring required, and the flexibility of the system means it can grow piece by piece. It’s also possible to use the system with non MusicCast products, as the Bluetooth-compatible MusicCast products can also transmit audio to other Bluetooth devices such as Bluetooth speakers or wireless headphones. The 670D provides a wealth of digital connectivity. 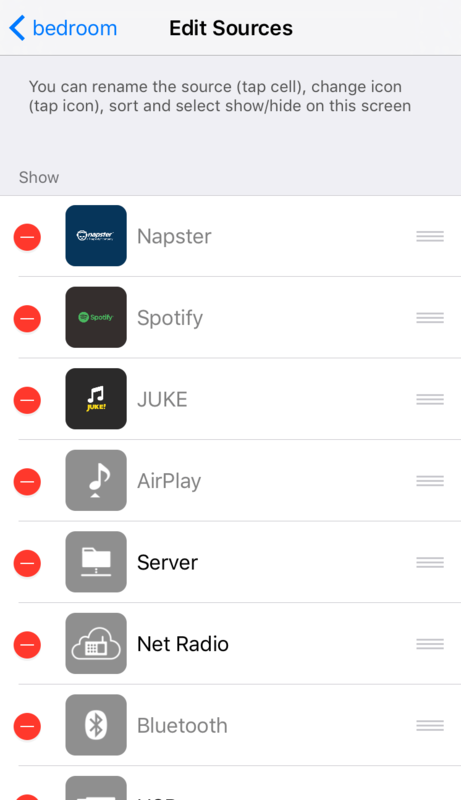 Apple AirPlay and Bluetooth (2.1+EDR) are onboard, as well as support for the vTuner internet radio service and a host of streaming services including Juke, Spotify Connect and Napster, depending on your country of residence. 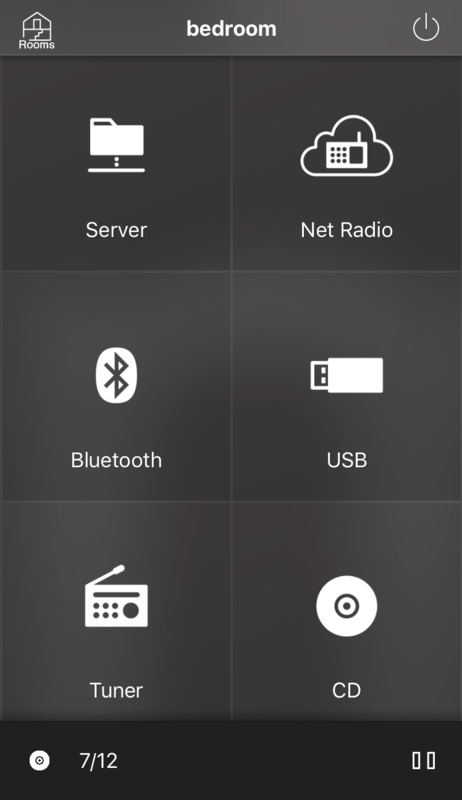 Media can be streamed via a DLNA media server, USB devices connected to the front panel USB jack and via a smartphone using the free MusicCast control app available for iOS and Android. The unit connects to your network via Wi-Fi or via a 10/100base-TX ethernet jack on the back. The 670D supports all common file formats, including FLAC, ALAC, WAV, AIFF, MP3, WMA, M4A and AAC. Resolutions of up to 24-bit, 192KHZ are supported, though ALAC is limited to a sampling rate of 96KHZ. The unit does support gapless playback. On the tuner side, both DAB (174 MHz to 240 MHz Band III) and FM (87.5 MHz to 108.0 MHz) with RDS are supported. There are 30 presets for each, which can be entered manually or filled automatically. The CD player will happily play just about any disc that’ll fit in the tray, including standard red book CDs and writable CD-R and CD-RW discs. MP3 and WMA discs are also supported. The player is designed to be eco friendly, consuming a maximum of 16W when in use. By default, that drops to just 1.8W in standby, as the unit will keep its network circuits active so as to enable the system to be powered on via the app. This feature can be disabled by enabling the eco mode, at which point the unit will draw just 0.1W in standby, but you will lose the ability to power up the system via the control app or an AirPlay or Bluetooth device. In the box, you’ll find the 670D itself wrapped in a cotton cloth bag, along with a remote control and batteries, some documentation and a run of the mill RCA interconnect cable. You also get a wire antenna for the tuner section and a combined wifi and bluetooth antenna which comes preinstalled on the back of the unit. Looking at the player itself, its front panel is deceptively simple. An alpha-numeric display takes up most of the panel, above which sits Yamaha’s traditional slim disc tray with an eject button. The display offers 3 brightness levels which can be adjusted using the units remote control, and indicators for Bluetooth, sleep, shuffle/repeat, Mute, FM stereo and tuning. To the left sits a power button and a USB jack used to connect an iOS device or a USB storage device. On the right, a rotary source selector is joined by a set of transport controls including previous, next, play/pause and stop. The latter control doubles up as the connect button when setting up the yamaha MusicCast system. On the back you’ll find the permanently attached power cable, along with the combined wifi and bluetooth antenna preinstalled in its screw terminal. The unit supports the 802.11 A/B/G/N wi-fi protocols at 2.4GHZ, and the bluetooth connection has a maximum communication range of 10 m (32.8FT). The analogue outputs are via a pair of standard RCA jacks, and there’s a single digital input in the form of an optical connection. I’d have preferred to see a coaxial digital input as opposed too or in conjunction with that of the optical variety, and perhaps a digital output or 2 so as to enable the 670D to interface with an external DAC. There’s an analogue input via a second pair of RCA terminals, intended to allow analogue devices to be connected to the unit when it’s being used with the matching A-U670 amplifier, and also allowing an analogue device such as a turntable to form part of the MusicCast system. Finally, a 3.5MM control jack connects to compatible Yamaha products, such as one of the matching amplifiers to allow them to be controlled by the unit. At 2.9KG, the 670D feels weighty for its size with a high level of fit and finish throughout. I was particularly pleased to note that the wifi controller has now been internalised, previous Yamaha machines required a wifi bridge or access point be connected up via the ethernet jack to get them online wirelessly. The CD tray is smooth and quiet, as is the transport mechanism itself. Variable-speed buffering technology stabilises the rotation rate of the disk, reducing vibration and mechanical noise during playback, meaning the transport is virtually inaudible when a disc is playing. The controls also have a solid tactile feel to them, particularly the input dial which offers a well defined click as you navigate between the sources. I do find those front panel transport controls to be a little redundant, however. They’re great for controlling CD, server, AirPlay or USB playback, but they won’t allow you to skip through tracks when you’re streaming via a mobile device, nor can you use them to control the tuner. Use of such functions will require the remote or the control app. You also can’t access the settings menu without the remote control. I can’t help thinking those controls could’ve been put to better use, for example, allowing the previous and next controls to scroll through tuner stations, and holding the play/pause control to change the tuner band. Pressing the previous and next buttons simultaneously for 3 seconds could take you into the settings, at which point the 4 controls could be used to enter settings in the menu. The remote is identical to that supplied by Yamaha with previous generations of their hi-fi component range. It’s not the best remote I’ve experienced, but it’s far from the worst. The controls are a little small, but they’re well spaced and laid out in a logical fashion. Power is provided by a pair of included AA batteries which install into a solid compartment at the back. The remote control also provides a favourites button which, when pressed, can automatically power up the system and play back a preset music source be that an internet, FM or DAB radio station or any of the other supported music sources. Once connected to the matching amp and speakers also supplied for review, I fired up the MusicCast app and was presented with a screen offering the option to setup new MusicCast device or to enter the app’s demo mode, which provides a selection of preset rooms as an indication of the capabilities of the system to a prospective buyer. 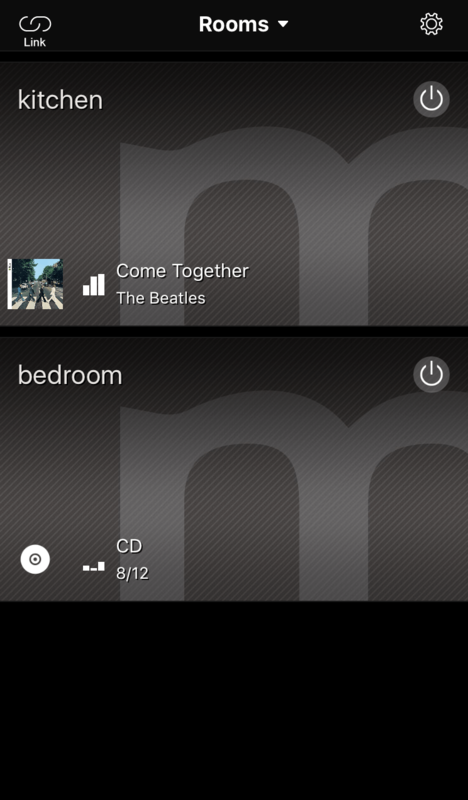 Tapping the setup button guides you through the setup of your MusicCast device. The procedure is hassle-free, and within moments of holding down the stop/connect button on the front of the 670D to enable the app to detect its presence, I had the player up and running on the wireless network, and a room name assigned. You can also personalise your room with a photo. Throughout this review, the 670D was controlled almost exclusively via the control app. 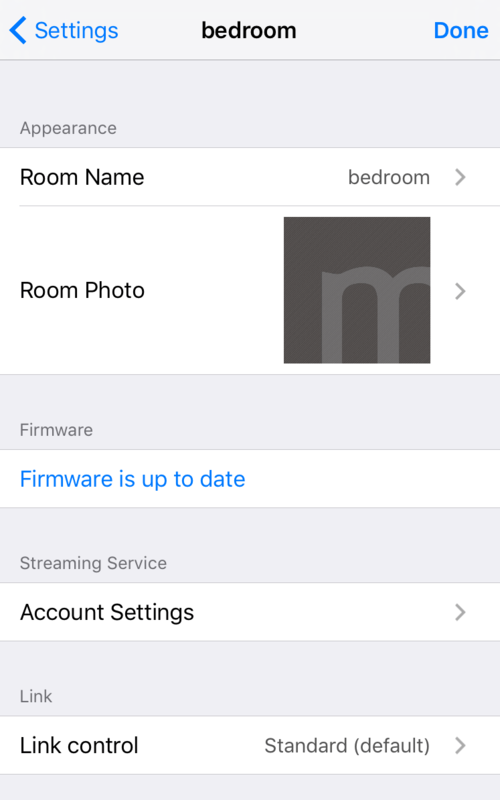 Upon completing the setup, the app immediately alerted me to the availability of a firmware update which I was able to initialise at the tap of a button, a progress bar on my iPhone detailing the update process. yamaha’s previous control apps lacked the ability to initiate a software update via the app and I’m pleased to see that this has now been rectified. With the firmware updated, the player started up by default in CD mode. The app first presents a screen in which to select one of the rooms on your MusicCast network. 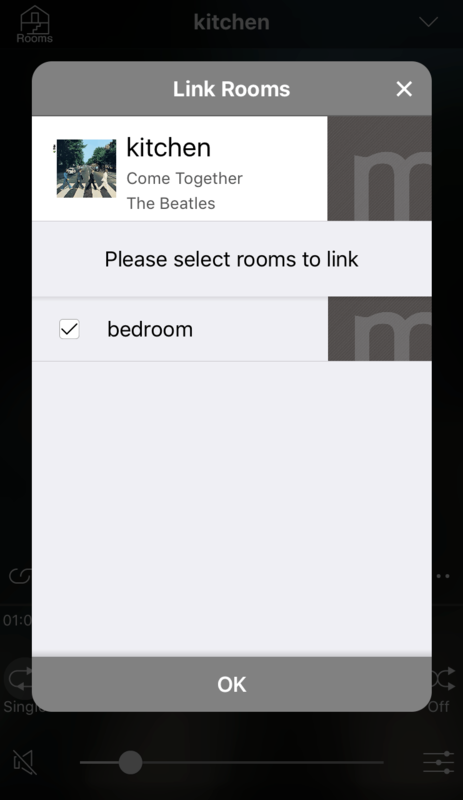 After selecting a room, the app presents a list of sources, along with access to your favourites and a search control which can search both the internet radio stations and your local on-device library. I’d like to see the ability to search local USB storage media and perhaps a connected DLNA media server. 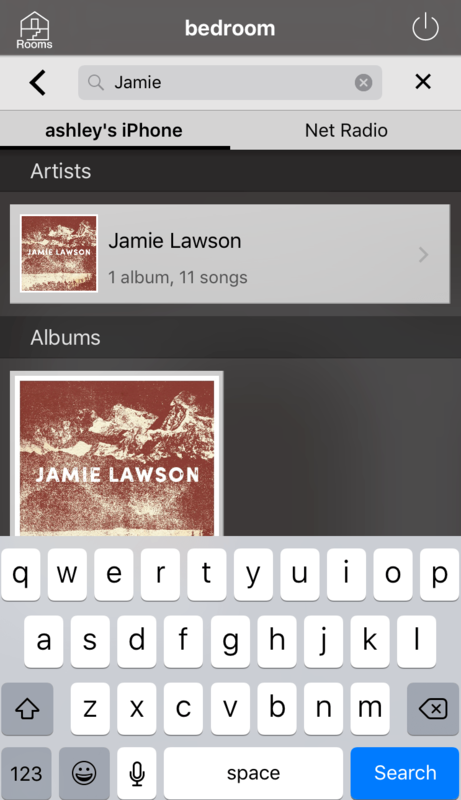 Searching the on-device library provides instantaneous results, presenting both artist and album suggestions. Selecting a suggestion displays the track list, as you would expect. 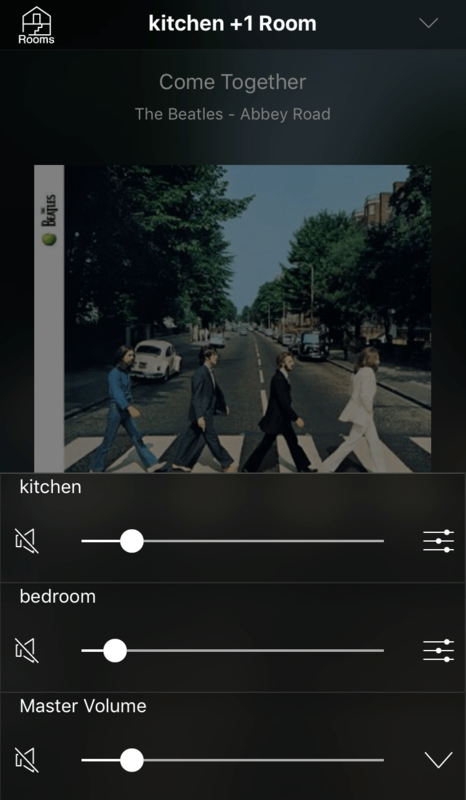 Selecting a song brings up the now playing screen which includes volume and mute controls, a set of transport controls, and a link control to send the audio to multiple MusicCast products at once. 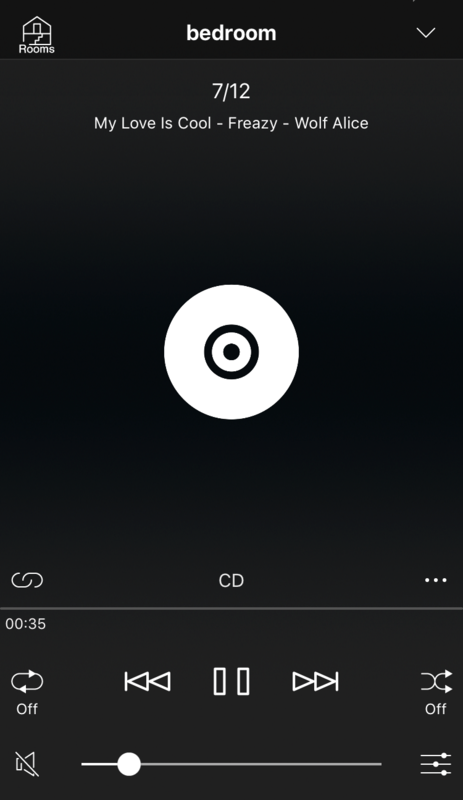 The example here shows the 670D playing a Wolf Alice CD and displaying the CD text including the track name, artist and album. Here is also where you can alter any sound settings for a given device, the example here showing the equaliser of a WX-030 speaker. In link mode, you can see all of your available devices and select those that you wish to have form a group. Once linked, any audio selected will transmit to all of those devices simultaneously. The now playing screen allows you to alter the volume of individual units, or control the group volume of the system via a single slider. 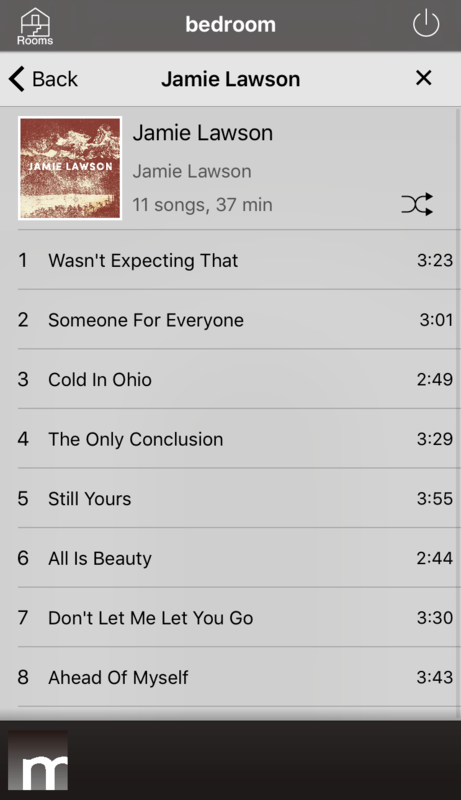 Closing the now playing screen takes you back to the previous screen, be that your track list or list of input sources. As you navigate the app for the first time, it’ll display a selection of handy help hints to show you how to find your way around. They’ll only display once, but if you forget something you can re-enable the messages in the settings. Accessing the internet radio section allows you to browse through the entire vTuner station library of more than 35,000 stations. Stations can be browsed by location or genre, and there’s a separate library for podcasts. The app lacks the ability to save and manage vTuner internet radio presets. Doing so requires that you register on the vTuner website and provide them your system ID, at which point you can manage your presets via their web interface. This limitation was present in previous Yamaha apps and I suspect it’s a limitation of the vTuner service itself. 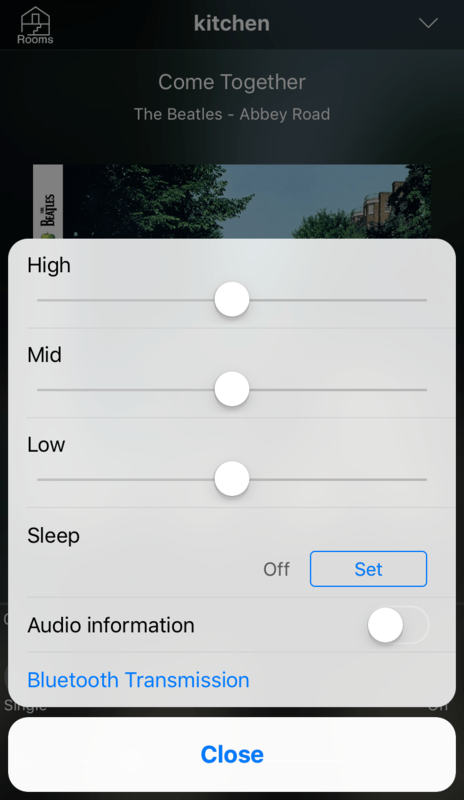 The room select screen also offers access to a settings page, giving access to both app and device settings as well as the ability to add a new MusicCast device to the system. Tapping on one of your existing rooms allows you to edit the names of the input sources, as well as hide those you don’t use. You can control the auto standby mode which will switch the system off after a period of inactivity, sign into your Juke and Napster accounts, and change the room name and photo. You can also view information about the device, including its network information, firmware version, current volume and system UDID, which is used to register the system on the vTuner internet radio website. 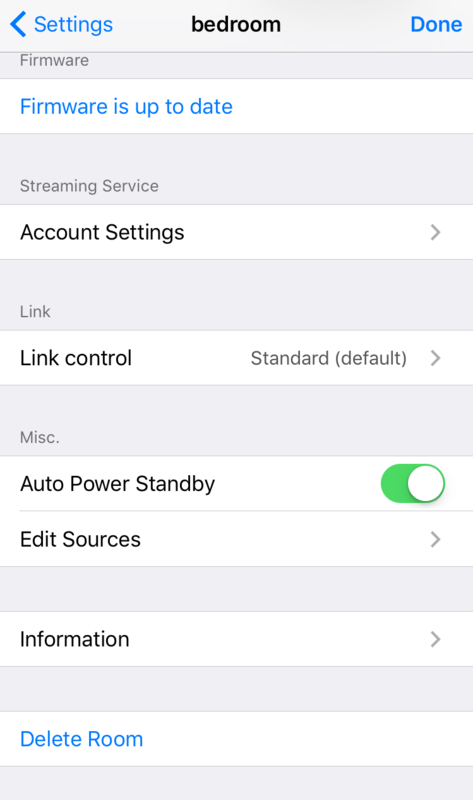 The app settings portion gives access to a few appearance settings, along with the ability to automatically disable the auto locking feature of your device when the app is running. You can also change the location name and clear all app data from your device. Other settings can be accessed using the menus on the device, or via the configuration page found by typing the unit’s IP address into a web browser. 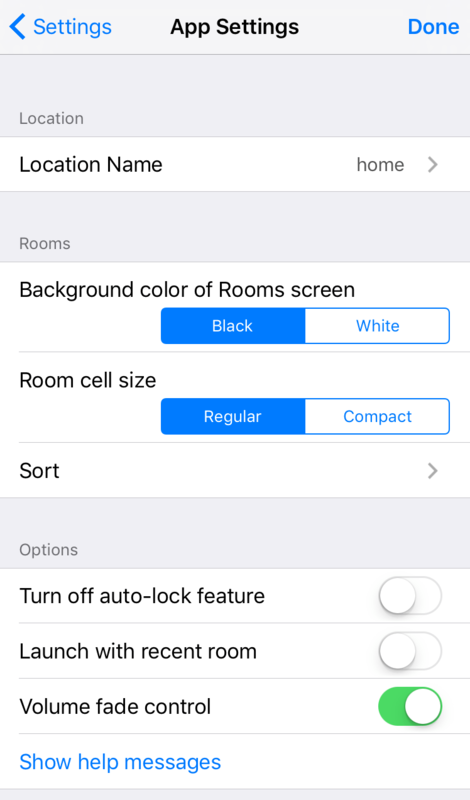 The configuration page allows you to alter the room name, network connection settings, mac address filtering, initiate a firmware update, set an AirPlay password or enable / disable the network standby function. Sound wise, the CD-NT670 offers up a sound that is packed with detail. It’s a very neutral presentation with no apparent exaggeration of any particular band of the frequency spectrum. Its ability to portray a convincing stereo image is particularly evident, though it’s not a player to over emphasise in that regard either. What goes in is, for the most part, what comes out. In summary, I find it hard to fault Yamaha’s CD-NT7670D. Ordinarily a CD player of this caliber would set you back a substantial amount of your hard-earned cash, and that’s not to mention the DAB+ tuner, the prices of which have been steadily increasing as internet radio continues to take precedence. But when that CD player not only includes the tuner but a fully fledged high-resolution network streamer, not to mention full multi-room audio support, you’re looking at a product that offers serious value for money. The CD-NT670 is as good as any stand-alone CD player, streamer or tuner at this price and beyond. An outstanding product, Highly recommended. I would like to couple the Yamaha AS1100 integrated amplifier with the CD-N670D for my music. I already got Klipsch RP-250F floorstanders and Yamaha RX-A1070 AV receiver which I bought for movies and music but whereas they are good with movies, the music is rubbish. So I,m thinking of a dedicated hi-fi stereo sound. Your thoughts, please. And, THANKS in advance for your help. Excellent setup. Given the quality of the amplifier I would likely pair it with at least a CD-S700 and NP-S303 instead of the CD-NT670D if you want the best sound, but there’s nothing wrong with the components you list. So,my idea is to make system of components that could work in later,upgraded system.What do you think about this idea?Which of these receivers would you choose,or would you recommend something else? The components you list are all excellent, so it’s really a matter of which you prefer. I like the MusicCast system a lot so my personal preference would lean towards the Yamaha. However I would always encourage you to demo the components if possible before buying. Thanks.And if I decide later to add some good cd player,like CXC,woud some of these receivers be good enough for CXC,or it needs much better amp-DAC combination? Yes. Though I would probably stick with a brand-matched CD player, so in the case of the Yamaha for example the CD-S300. Hi, as CD-NT670 has musiccast, is it possible to link have music directly in WX-030 speakers also musiccast enabled? Thanks, Bogdan! Yes absolutely, using the ‘link’ feature. Hi Ashley, thanks for feedback. So, I can connect cd-nt670 directly to my wx-030 without using a receiver as amp, right ? Thanks again ! You certainly can. Set them both up on the same network. Use the ‘Link’ feature of the CD-NT670 to send its audio to the WX-030, and anything streamed through it will play through the WX-030. Yes, providing your TV has an optical output. To be precise NAD D3020-Monitor Audio Bronze 2. Hi,Ashley! What would you rather take,mcr870 or Nad D3020-Monitor Audio match? I want to buy a new hi fi. Would you recommend yamaha mcr n670d or marantz m-cr 611? I personally would have the MCR-N670, though I would encourage you demo them both if at all possible as tastes differ. Note that the Marantz doesn’t include speakers so you will need to supply those. I need some advise. I have a 70’s Kenwood KA 7100 and Klipsch KG4 speakers that I love to use. They look really great also! However, more and more of my music is coming from online and/or digital. I am wanting to update/upgrade my system to play digital music in a more effective convenient way that sounds better than what I am currently getting from an iphone lightning cord to 3.5mm cord. I have been looking into DACs, CD players, music Streamers, new laptops, and I am completely confused now. The Yamaha CD-N301 and CD-NT670 seem to fit what I need. Any thoughts on what I should and should not consider. Hi Richard – It depends on the sources and services you intend to stream. Are you streaming from your local network? From Spotify? Internet radio? I would consider the CD-NT670D over the CD-N301. The CD-N301 is an older product with an older platform that is nowhere near as good as Yamaha’s MusicCast platform. The CD-NT670D is a truly excellent player and gives you the option of adding more MusicCast products in the future if you wanted multi room audio. An alternative would be the NP-S303 which lacks the CD drive. Either would complement your KA-7100 nicely. Yes, IMO a great match. Not too dissimilar to your old Nad but a nice upgrade. Thanks for this very clear review. I’m looking into a new hifi-system and one proposed me the Yamaha A-S501 amp + CD-NT670D (for MusicCast) + B&W 685 s2 speakers. What do you think about this set up? A very fine combination. The only thing you won’t get is volume control via the MusicCast app, as the A-S501 doesn’t have the necessary control input jack. The remote for the NT670D should operate both units though. Hello Ashley. Have purchased the Yamaha amp and cd unit based on your review. Very happy. A very small footprint compared to my old 40 year old gear. I want to use the MusicCast app to listen to music in other rooms of the house using wi fi. I have a BT router. Will this be man enough for the task. Any advice on which speaker to purchase for the other room?? Hi Victor – Glad you’re enjoying your new system. Your BT router should be fine providing you get a good wifi signal in the rooms in which you plan to install speakers, or you could hardwire the speakers using home plug adapters if you don’t have network wiring throughout your house. With regards other speakers, you’ll need MusicCast compatible units. 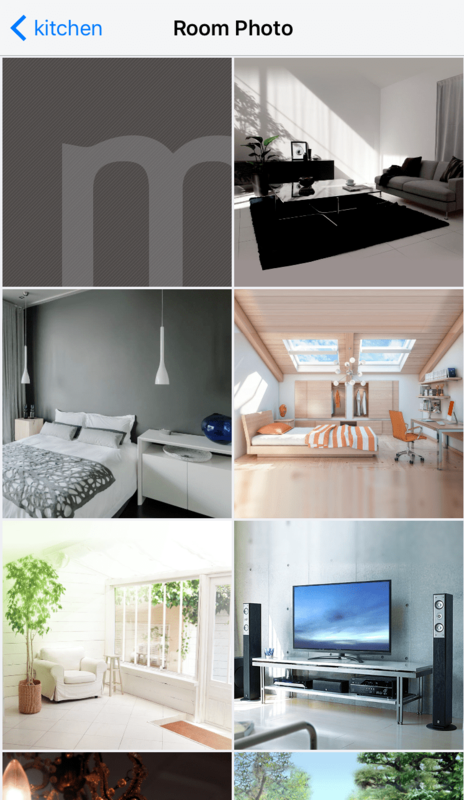 You can see a list of the MusicCast products Here, choose the products that best fit the room. There is a great range and they all perform very well. Have you got a chance playing this receiver with different amps and speakers? I’m considering buying it and matching with some compact size speakers and compact amp. Altogether I have something like 1,5k USD budget and limited space I can devote for both speakers and electronics. What would you recommend ? The system will be primarily used for radio (Internet, FM/DAB) and some Spotify/Tidal (CD player is not a priority as I have old Danon CD/DVD player that hopefully can be plugged-in into amp). the sound quality when matched with budget speakers like these ones? Or maybe it is would be better to find some better speakers first of all? You have a few options for small amps. There is the matching Yamaha A-U670 which could work depending on how loudly you want to play. Or perhaps something like the Marantz HDAMP1, or a streaming system like the Cambridge Minx XI though the latter doesn’t yet natively support Tidal. I’ve never been a huge fan of the Rega Brio but I haven’t heard the latest version. There really is no comparison, the 501 and 701 will easily out perform the smaller amp. If you have the space and the budget, those are your best options. The 501 is brighter and more lively, the 701 more neutral with slightly more power and better imaging, so choose whichever better suits your tastes. Ashley, my speakers (QA 3020) will be standing on the cabinet only 80 cm from each other and I don’t listen very loudly. Do you think that in such conditions difference in sound quality between A-U670 and A-S501 will noticeable for the ‘average’ man. Forgive me that Im asking you again and again but I’m worring that A-S501 will be a bit too large considering the size of the cabinet but I’d like to have best possible sound at the same time… Thanks! Absolutely, the A-S501 is in my opinion clearly a better amp. The A-U670 is good, but it is designed to be a small format amp and as such there are limitations where performance is concerned. Yeah! St Claus gave me both the player and A-S501 amp and now I’m exloring features 🙂 I wonder how to connect player to amp properly; for now connected it to tuner audio-in slot but if I change source to CD shall I change to CD slot? Or which input in amp should be choosen when streaming from internet? Thanks! All of the inputs on your amp, besides the Phono input, are line level so you can connect to any of them. CD, Tuner, Line 1 etc. Source selection of the player’s sources will be controlled on the player itself, the amp should be set to whichever input you’ve connected the player too. Hi Ashley, thanks for this review. I need a new CD player as my old Sony one has died. I play my other digital music from a hard disc accessed through a Squeezebox Touch and a 2010 Cambridge Dacmagic DAC. How would the, presumably, more modern DAC in the Yamaha compare in sound quality with the older Dacmagic. I.e. should I buy this CD player/streamer or should I just buy a CD player/spinner with digital outputs for my existing system? Hi Peter – presuming you’re happy with the sound of your current setup, I would simply buy a cheap CD player with a digital output and use it with your DACMagic. CD players are plentiful on the used market and a bit of searching could find you something perfectly usable for £40 or so. What is the model of your Sony? It could likely be repaired for even less than that. If you wanted to go down the new route, you could look either at a cheap CD player again with digital output, or perhaps the CD-NT670D would suit if you’d find its other features useful. The CD-NT670D would give you an all-in-one solution for CD and USB playback as well as playback from network and USB devices, a great DAB tuner and multi-room audio support. I doubt the difference in sound quality between the NT670 and the DACMagic would be an issue, the NT670 might just have the edge but digital audio is digital audio and really the final analogue output stage is the key difference. I bought a pair of active monitor speakers and I would use this yamaha as a preamp too. Is the analog output variable with the remote ? Afraid not. The remote, and this unit, can only control the volume of a connected and compatible Yamaha amp via the control link jack. The analogue output itself is fixed at line level. Thank you so much for your quick answer. Have a nice day. Best regards. Il was on search of reviews about this player ans found yours, which is really informative. Thanks a lot for this nice work. Cheers from Belgium ! Thank you for your detailed review. I’ve just brought the CD-NT670D and I have to say WOW!!!! It is so much more than a CD player. The DAB tuner is brilliant, internet radio allows us to find the stations we enjoyed listening to on our holidays, AirPlay works and the CD player is great. The display on the unit is easy to read from the sofa without glasses. The MusicCast app is pretty intuitive and the firmware was updated on initial setup. Yamaha have announced that it will also support TIDAL and Deezer through a firmware update. Hi..Just bought the unit and love it…What Yamaha Sub model would be best suited ?And does it take either passive or powered? The CD-NT670D can’t be connected directly to a sub. What amplifier are you using? If you’re using the matching A-U670, or A-670 you’ll need an active sub. Interested to buy MCR-N670, and was wondering how did you like the speakers NS-BP301 that come as part of the package? Do you know how they compare to similarly priced Wharferdale Diamond 220 or Q acoustics 3010? I reviewed the NS-BP401s. The NS-BP301 is essentially a scaled-down version. I’ve not heard them, though I’d imagine they perform well and are a good tonal match to the system. You may find the other models you mention perform slightly better, though it’s really down to personal taste. Firstly thanks for your reviews, they are probably the best all around the net. I am pretty confused looking for a good quality equipment. I have a pair of Bose ML2 speakers (about 20 years old), Technics SU-Z22 amp and Technics SL-D3 turntable (both 30 years old). I am looking for a modern device that allows me to use both the speakers and the turntable, and that comes with all of those new features, WiFi, bluetooh, Spotify, USB, vTuner, and also CD. I found the all in one Pioneer NC-50DAB, which features everything I am looking for, even phono in for the turntable. Do you think that would be a good choice? (Maybe a silly question…I do not need the amp for using that pioneer, do I? I am taking into account another option, as somebody told me the audio and components quality is better in Yamaha products than Pioneer, I found this Yamaha CD-NT670 you reviewed. I guess I would need my amp for using this, am I right? What is your opinion? What would you do? My budget is the 800 eur the Pioneer costs. Thanks very much and sorry for the mess. Hi! Firstly, I’ll address your comment regarding the quality of Yamaha and Pioneer components. The fact that one brand offers better audio quality and features better electronic components than the other is purely subjective and has no factual basis. Both companies have and still do produce excellent components, just as both have had the odd component in their past that time has, for good reason, allowed us to forget. Pioneer’s consumer audio division is now owned by Onkyo anyway. First to your existing equipment. You actually have a pretty good turntable, I’ve always liked Technics turntables. With a service and a stylus replacement, that deck has many years left in it yet if you were happy with the sound and wanted to keep it. Your amp is pretty good too, though at the lower end of the Technics range. I’m afraid I have no experience with those particular speakers. The Pioneer NC-50 you linked to certainly looks to fit the bill, and it’s rare for a mini system to feature an internal phono stage. Similar offerings from Marantz and Yamaha certainly don’t. The Yamaha MCR-N670 and MCR-N7870 systems are a good alternative, though you’ll need an external phono stage with either. To be honest they’re all very similar. They all use class D amplification, all produce enough power for most listening rooms into a reasonable pair of speakers, and all offer the features you want though the Pioneer internalises the Phono stage. If you like the look of the Pioneer, go for it. I think I will go for the Yamaha, but I have one more question, is the CD-NT670D equipped itself with USB DAC or that function is in the amplifier A-670? The CD-NT670D does not feature the USB DAC. That feature can only be found in the A-U670 amp, the standard A-670 doesn’t have it either. And about the Marantz MCR611 as CD and streamer? Do you think it can offer the same quality as Yamaha 670? I think that a system comprised of separates will always better an integrated system. If you like the small size of the mini system, you could always look to pair the CD-NT670D with either the A-670 or A-U670 amplifiers, the latter supporting USB and DSD streaming. It depends how loud you like to play. No mini system or mini amp is going to win any awards for volume. If you like to rock out or enjoy classical with large transients, stick with the amp you’ve got. Hi,Ashley! Is this mean that MCR-N670 can not be connect to PC without additional DAC? The MCR-N670 cannot, you’ll need the MCR-N870 for that. Hi,Ashley! Is this mean that I would not be able to connect MCR N670 to my PC for playing ftles storaged in it? Sorry,I did not notice yor reply. But I could connect it via external DAC or sound card? Wich one would recommend more in terms o audio quality and easy use? I’d probably go with the Yamaha. Both are similar in terms of features, but the Yamaha is a newer player and has an excellent CD transport. I am a bit concerned about Bluetooth radiation. Do you know if the Bluetooth can be switched off ( like that on a PC or Mac ) when not required i.e. using it like an ordinary HiFi system ? You cannot disable the bluetooth controller. The only way to effectively disable it would be to connect the streamer to the internet via a hardwired Ethernet connection and then unscrew the wireless antenna but I wouldn’t recommend this. Out of curiosity why are you concerned about bluetooth radiation? Can You connect turntable to it? Yes, providing you either use an external phono preamplifier suitable for your cartridge, or one built into the turntable itself. Cannot get sound from speakers when iPad is connected to system. Sound is ok when playing cd’s or radio. iPad has been paired. How have you paired the iPad? 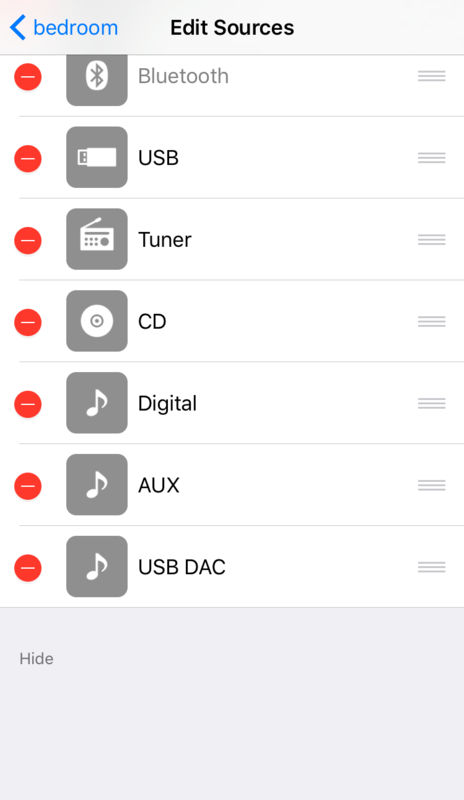 are you using Bluetooth, AirPlay, or the MusicCat app? Does anyone know the DAC Chip used? Tx! The DAC is a Burr-Brown chip, but I’m not sure of the model. I will ask Yamaha for clarification. Have enough courage to do so. Hello, do we have the confirmation of the DAC model ? Thank’s ! Afraid I haven’t been able to get this info yet. It’s not the same ESS DAC as used in the A-U670 amp. It’s really the output stage that matters though in my opinion, the DAC chip is of secondary importance if implemented well. I was looking at buying one of these, but I like to be able to change radio stations without relying on either remote or app. Can you really not switch DAB stations using the transport controls? I thought as the Previous/Next buttons are labelled ‘Presets’ on the front you could. Not the case? That may very well be the case, presets are typically the one feature I didn’t use and I must admit i didn’t even think to check. If they’re labeled as such, I see no reason why it wouldn’t be the case.